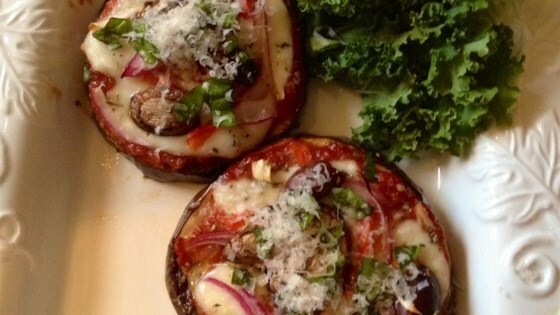 "Mini eggplant-based pizza rounds! Variations are limitless. I bake these at 6,000 feet in Tahoe, so you may want to bake longer if you're at sea level." Flip the eggplant rounds; top with Parmesan cheese in an even layer to cover. Return eggplant to oven and bake until the cheese is melted, about 5 minutes. Drop a dollop of tomato sauce into the center of each eggplant round; top with Cheddar cheese. Bake until Cheddar cheese is bubbling, about 5 minutes more. Season with salt and pepper to serve. This was awesome!!! I added Jennyo italian sausage and turkey bacon bits I was in pizza heaven!!! Noto very good to our family. I don't think 1 T> oil is sufficient, and iit was too chewy, even after a longer than normal baking period. Maybe needs to be covered with foil? A quick, easy and tasty entree after a long day at work! Takes virtually no time to prepare.